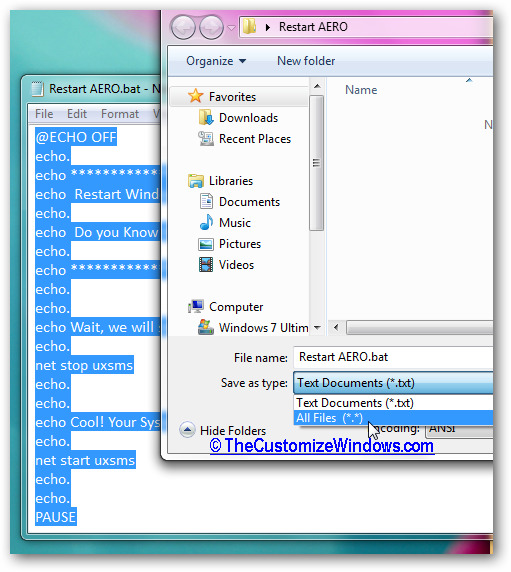 Restart Windows 7 AERO with a simple batch file just created by you. You can add the Restart Windows 7 AERO in Right Click Context Menu too. How we will restart Windows 7 AERO? Actually, the AERO can be restarted from command line using uxsms command (start or stop). Batch files makes the process easy to execute by simple clicks. So, we will create a batch file to restart Windows 7 AERO. echo Do you Know that TheCustomizeWindows.com has 235+ Windows 7 Tricks? echo Wait, we will stop the AERO now, OK? You can change the red texts in the Restart Windows 7 AERO with a simple batch file with your own. The batch file of Restart Windows 7 AERO we created should be with administrative privilege. So, right click on the Restart Windows 7 AERO.bat file you have created and Run as Administrator. This Article Has Been Shared 9021 Times! Get an option to open a folder or hard drive partition in new window from right click context menu in Windows 7 with this easy registry trick. After reading this tutorial; you will be able to make your Windows 7 Computer speak the current time and date every time you log on. 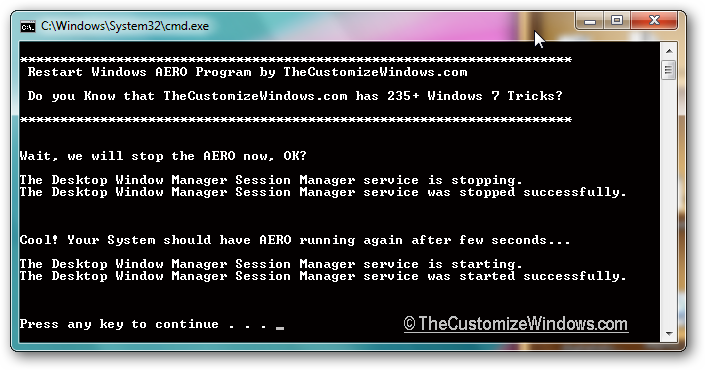 Cite this article as: Abhishek Ghosh, "Restart Windows 7 AERO with a simple batch file," in The Customize Windows, July 13, 2011, April 25, 2019, https://thecustomizewindows.com/2011/07/restart-windows-7-aero-with-a-simple-batch-file/.